Bead Nabber  - $1.90 : Yarn Tree, Your wholesale source for cross stitch supplies. Item 3555. Bead Nabber. 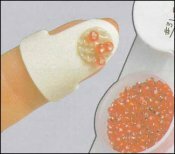 Retrieve seed beads easily with the touch of a finger. Just slip the Bead Nabber on, lightly press into beads and presto! A small number of beads are ready for use. LoRan’s Bead Nabber adjusts to any finger, holds beads for easy threading, eliminates skewering beads, and protects your finger from the needle’s point. One Bead Nabber per card. Made in USA.